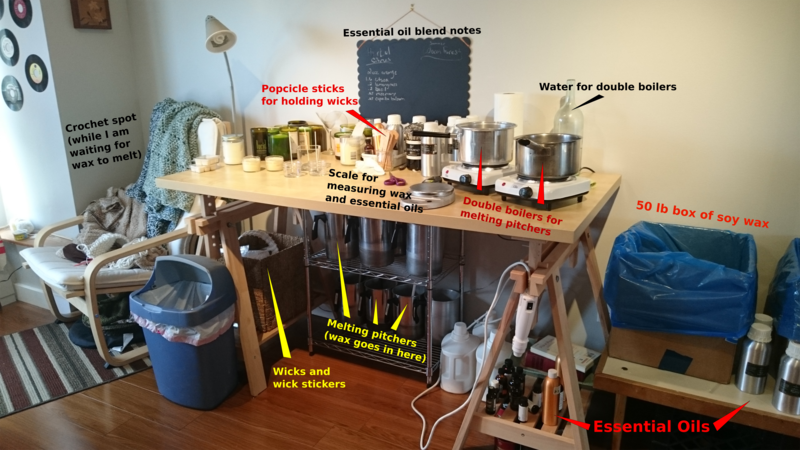 Have you ever wondered what a candle making battle station looks like? Well, look no further! I forgot to label a couple things. There is an infrared thermometer and a heat gun. The thermometer is pretty obvious as to its use. For the essential oil to blend into the wax, the wax has to be at a certain temperature, usually around 175 degrees (different oils blend at different temperatures). After I heat the wax and add the oil, I then have to wait for the wax to cool off to the “pour temperature”. Basically, if I pour the wax when it is still really hot, it will cool unevenly, which can cause the wax to “crater” and basically not look nice. I wait till the wax is around 110 degrees before I pour it. And even if I do wait till the right temperature, sometimes the tops of the candles still aren’t smooth and nice, so that is where the heat gun comes in. I hit the tops of the candles with the heat gun to melt the top layer and even out any craters or holes. Also, I do stand at the table, and I do have an anti-fatigue mat, but I forgot to put it back for the picture (today was a cleaning day, and figured it was also a good time to take a picture). Warning, this is a very dry post, crunching numbers and minute details. I started musing if it was actually feasible on a cost level, meaning, could I sell them low enough that people would feel comfortable paying monthly for them. I think people are more comfortable spending a bit more if it is a random one-off purchase, but less comfortable spending the same amount on a monthly basis. And would that price also be enough for me to cover my time and effort. First off, I needed some goals. I wanted several candle tiers, the lowest being sample size (< 2oz), a small size (~ 3oz), a middle size (~ 10oz), and then my wine bottle size (~ 10+oz). I figured this would make it accessible to a wide range of people, and also provide a chance to try something smaller before committing to something larger. I also wanted to push myself to come up with new essential oil blends for my candles. A new one every month is too much, cost-wise. I do extensive testing on my candles and scents, so that is essential oils that I am buying and burning and not selling until I get it right. I figured every two months might be more doable, and I might cycle out some fragrances, probably based on the seasons. So, now I needed to look at materials cost. I started with Lavender, as that is my most popular scent, and it is right in the middle, cost-wise, of all my fragrances. I buy my essential oils from http://www.camdengrey.com/, and all my wax, wicks, and jars from http://candlescience.com. I will link to my spreadsheet with my numbers, but I’ll just put the end result here. Shipping charges for the materials to me comes out to about $0.57 a candle, regardless of size. I got this number by filling up my cart with one 50lb box of wax, 8 cases of the mason jars, 4 cases of the tumblers (which is what a 50lb case of wax will make), plus enough wicks and stickers. Got the shipping charge for all that and divided by the number of candles I can make (150). This number will obviously fluctuate depending on what I need to buy and when, since I won’t always be buying this exact same cart every time. The 4oz mason jar, which actually holds 3oz by weight of wax, costs $1.23 in materials (and that is not including shipping charges when I order the supplies), so I am going to round that up to $2 just for materials. And then shipping from me to you is about $3. And I decided to charge $9/month for this candle. I am making about $4 on each candle. Actually, make that $3, because Patreon and credit card fees take about 7-9% of that. The tumbler, which holds 10oz, costs $3.21 in materials, again, not including shipping charges to me, so closer to $4 in materials costs. Shipping the finished candle to you costs about $7. So $11 to make the 10oz candle, and I am charging $20. Note that I am calculating shipping based on shipping from NYC to California. If you live closer to NYC, then I would pocket a little bit more from each candle. Should I be charging more? Less? Comments or suggestions? This is the first of 2 (or maybe 3) posts. I was inspired to start blogging again by a twitter follower (you know who you are, let me know if you want me to link to you!) because of a conversation we were having about me starting a Patreon. And by blogging, I really just mean, I am probably going to make these couple of posts, and then disappear again for a year…. Anyways, I keep seeing people talking about their Patreons, and it got me wondering if there was a way for me to create on Patreon doing what I currently do. I’ve worn many hats in my 30 years of life. I’ve worked in the food industry, veterinary offices, libraries, and distance learning education. On the more creative side, I’ve designed websites and logos, created open source game illustrations, been a printmaker and a pinhole photograher. My latest creative endeavors are quite a bit different, however. I started to get into “upcycling” various things found at thrift stores (I LOVE thrift store shopping!). First was bird feeders from those flat woven plate holders. Then it was covering old lamp shades with either handmade paper or old dictionary pages. Then I started looking at the things I myself throw away, and came across glass bottles (mostly of the alcoholic variety!). My first thought was drinking glasses. I ordered a glass cutter (much much much better results than lighting-the-string-on-fire method…) and some sand paper and went to town. I wasn’t happy with the feeling of the edge for drinking, though. Not that it would cut you, it just wasn’t soft on the lips (this is Very Important that it be soft on the lips!). So, what else? I looked into making candles from them, and it seemed easy enough, and required very little upfront to just test out and play around with (I’ve been using CandleScience for most of my candle making supplies for years now). I finally found a work space! I have a lot of crap to move in, but the goal is to only have the space for 6 months to a year (probably), and to have less stuff going out than I am putting in. You see, the problem is, I have started way too many projects over the years, and I need to purge. But I hate just throwing things away. So I am not buying or starting any new projects till I go through all the stuff I have now. Then, I will continue to do the stuff I found enjoyable and profitable, and let that be that. I really want to simplify. I have too much stuff. Stupid scan lines. But you get the idea. I need to find a professional place to get my negatives scanned. I really love the details on the left side. My pinhole photography will be at the International Center through Feb. 3rd. I am having a closing reception at the Center on Tuesday, Jan. 31st from 6-8pm. Come out for light refreshments and if you have any questions about pinhole photography! My pinhole photography will be on display in January (2012) at the International Center on 23rd St. Details on the reception soon to follow. Just saw this guys website. He does a lot of stuff with pinhole photography, and I thought it was awesome! I have been wanting to try a “Minty Cam”! Make sure to check out his images, too! Quick post. We moved to NYC. My pinhole photography is already up in a cafe gallery. I can’t wait to take more pictures. I am thinking a pinhole of the protesters would be nice :).